A clay tablet from the 1st Century is found in the ancient ruins of a village in Israel, with writing and a name on it—from the 21st Century. Solving the riddle of the Pyramids, along with a unique form of gold found on the moon during the Apollo 17 mission, coupled with the mystery of the Zodiac Constellations—a mixed group of scientists and archeologists uncover an apparent time travel corridor—to the year 30AD. Is this science for real? Is the group for real? Or is it all a ruse to hide a terrorist cell planning massive mayhem and destruction? The Department of Homeland Security wants to know. One determined person, along with an avowed atheist, journey back to 1st Century Israel to find the evidence of who Jesus really was. Was he a man with his own agenda? Was he a deluded prophet? Or was he the Son of God? An uninvited traveler joins them on this journey bent on a private mission of self-justification and revenge. Volume One is: The Journey – packed with the excitement of science unraveled along with the doubting Department of Homeland Security following its own course of action. Volume Two is: The Journal – the exciting record of what they encounter and discover 2000 years ago – today. Both volumes, with multiple twists, turns and surprizes are included in “Beneath the Turbulence”. click on the link below and follow the author on his blog. 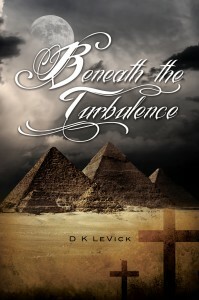 D K LeVick’s new book, Beneath the Turbulence, is available in paperback. Copyright © 2019 Beneath the Turbulence.